Names and titles should be spelled out. 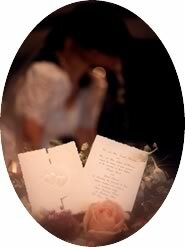 The only exceptions are Mr., Mrs., Ms., and Jr.
Write out all dates and times in the invitation. The numbers in addresses need not be spelled out, although streets should be. Include the state if the city is not well known. Put response cards and stamped, pre-addressed envelopes inside the invitation with any other enclosures. Place this in the inner envelope, and put the inner envelope in the outer one, so that it faces the back flap. Do not seal the inner envelope. Address it simply to "Mr. and Mrs. Jones". Do not use first names, except in the case of children. Even then, they should be listed on a second line underneath their parents' names. Envelopes should be addressed in black ink and never typed. Do not abbreviate names or addresses and include the return address centered on the back, near the top. Mail invitations four to six weeks before the wedding. Mail announcements on the day of the wedding (or soon after). 1. Insert invitation into the inner envelope along with enclosure card, reply card and any other enclosures. Always remember the front (printed side) of the invitation faces the back side of the envelope, fold down (see diagram A). The tissue that is placed over lettering to prevent smudging may be discarded or left in place. 2. Place the unsealed inner envelope into the outer envelope. The front (addressed side) of the inner envelope faces the back flap of the outer envelope (see diagram B). Take a blank piece of paper and start writting. It does not have to be perfect the first time. Just keep triing until you feel it is perfect. Show friends and family to get a feel for more ideas if you become blocked. Walk away from it and return later if this helps.